Studies of depression abound, as do opinions on how best to treat it. Yet there is a question that barely gets asked: is depression a defect? Most of us take the answer as a given – whether we believe the defect is one of brain chemistry, of cognition, or of character. But psychologist Jonathan Rottenberg, an expert on the science of mood, believes that this automatic response has been profoundly detrimental to our thinking about depression and to the search for better treatments. The disease/defect model of depression has served to carry on the centuries-old stigma of mental illness while still not delivering either an explanation or a cure. In its place, Jon Rottenberg suggests that we should, instead, consider depression in evolutionary terms. Sadness, and depression, have deep roots in our development as a species, which helps us to understand why mood disorders can be so tenacious. Bringing research on mood and mood disorders to bear on depression allows Jon to tell a very different story than we have come to expect. 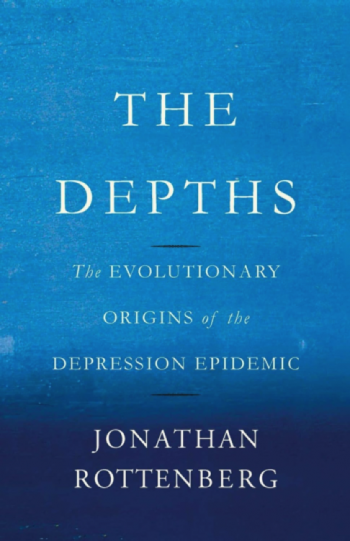 And his book, The Depths: The Evolutionary Origins of the Depression Epidemic, weaves together research, clinical observation, and the voices of people who have struggled with depression. Jon’s perspective is informed by his own experience – as a young man he lived through a serious depressive episode from which he emerged determined to explain it to himself and to others. His goal is no less than to change the tenor of the conversation about depression and to transform the way research on this very human experience will be done in the future. In this courageous and compelling book, Jonathan Rottenberg makes a moving appeal to bring depression out of the dark so that we can have an open conversation about one of the most dreaded mental disorders. Writing both as someone who has suffered from depression and as a scientist who has published groundbreaking work on this disorder, Rottenberg weaves a rich tapestry of personal stories and scientific findings. What emerges is a sober account of how and why depression arises, and what needs to be done. Everyone should read this book! In this provocative presentation of the natural history and evolution of depression, the bottom line is, strangely, both deflating and hopeful: “Low mood is both inescapable and sometimes useful.